I have been interested in upgrading to a HRC Tank for quite some time. I could have done this last year when I bought a carbon fibre version, but it lacked the recesses (seen in the photo) for the factory Honda logos. By chance, someone was selling a HRC tank cover By Hotbodies racing. By the time I found it, the tank was sold. I then set about contacting them Hotbodies and can only describe the experience as poor. Despite emails and messages on facebook and twitter they have never replied. Anyway back to the tank cover. The main difference with these covers are that they are not rounded off so provide great stomach support. 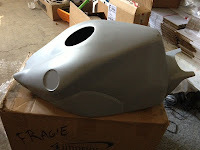 This funnily enough, is also the design of tank used on the RC213V.